As I sit here and enjoy my Starbucks coffee this morning, I am getting the influx of emails and texts about the latest warning issued by the FDA to KIND snacks stating that their bars are not “healthy”. Before you stop buying these energy packed snacks with your latte. Let’s first discuss what this warning really means. KIND has been using the term “healthy” on their bars, and that term does not come without a cost. There is a legal definition of what “healthy” is on a food label. Four of their bars do not meet this definition. There are regulations that a company must comply with when using the word healthy on their product or website, according to the FDA. For a food to be labeled healthy it must be low fat and saturated fat, low sodium, low cholesterol, and contain at least 10% of the RDA for vitamins A, C, calcium, iron, protein, and fiber. If you’re into all the details, read the regulations here. News flash– many whole foods don’t even meet this definition. The main issue here is the nuts in the bar… they are not low fat, but we know nuts are good for us!! I’m all for truth in marketing and understand the legal requirements that companies must comply with… I’m married to an attorney after all, but really? This is a bunch of garbage. Not all energy bars or KIND bars are created equal… some are higher in sugar than others but for the most part KIND bars are one of the most wholesome bars on the market and I’m not going to stop recommending them to my clients. All of these news articles that are construing the product in a negative light are confusing the consumer. When we think healthy, we think of “health” but when talking legalese.. health has a whole different definition! Here’s what I look at when finding a healthy bar. Whole Foods. I want a food bar that is made with real fruit, nuts, seeds, etc. Not something that is chemically altered and super processed. That’s why I love KIND bars, you can see the food that is in the product through the packaging and when reading the label… nothing is fishy. Low Sugar. For a 200 calorie energy bar, the lower the sugar the better. Most bars need a bit of added sugar if using nuts to get the product to stick together. I learned this when I made homemade KIND bars. Aim for 10grams of sugar or less, and 5grams if possible. Natural sugars are better… LARABAR uses whole foods and blends them together, kinda like my Fig Power Balls. Love those guys too. No Fake Ingredients. Sorry Quest bar fanatics, but I’m not a fan of synthetic or fake fibers as I like to call them and sugar alcohols… hello diabetic candy and GI upset. I realize that there is a purpose for these products for some consumers, but don’t think they are for the general healthy population. Cut the crap in the food and just eat the real stuff. If you cannot pronounce or recognize the ingredient in the food as a whole food, put it back. Protein. A good protein bar gets it’s protein from nuts and seeds and protein isolates (like whey or soy) if higher protein. It’s often hard to get a good wholesome bar with loads of protein. My suggestion is to eat your whole fruit and nut bar and pair with Greek yogurt, cottage cheese, hard boiled eggs, or my favorite a latte for a protein packed snack. I’d love to hear your thoughts. What do you think of the FDA regulations, and what’s your favorite energy bar? Great info and glad I read your post! Another bar I can FEEL the difference is the Cliff bars that are low glycemic -literally on the label. I can add sugar snap peas or other veggie and fruit and I feel great until dinner. Would love to hear more about why and what else to shop for that is similar. What’s your opinion on Cliff’s Builders bars and the Think Thin bars? They are so yummy! ooooo.. sounds like that might be a good post 🙂 Thanks MIN! I hadn’t heard about the FDA statement yet, but I’m glad to hear your thoughts on Kind bars! It’s so hard to look at the word “healthy” in such black and white terms. I love Kind bars for their simplicity, and I certainly don’t mind eating healthy fats from nuts. It can be hard to make healthy decisions when there is so much conflicting information out there! Agreed– thanks for sharing it! This is awesome thank you so much for sharing! Could not agree with you more! I hadn’t even heard of this! Great post, totally sharing! 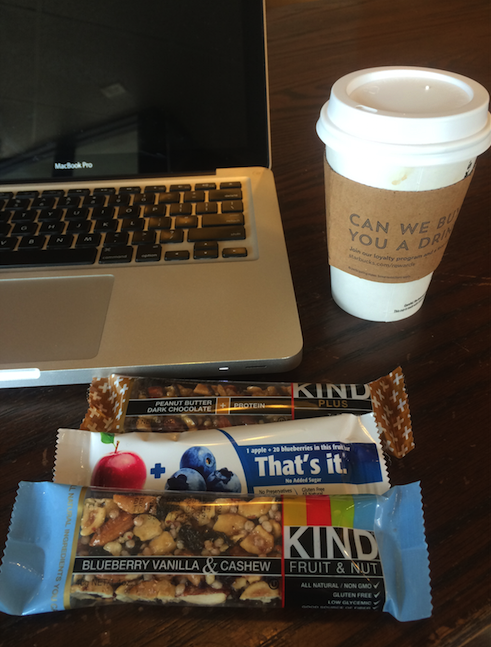 Most of my trips to Starbuck’s includes devouring a non-fat latte and one of the KIND bars! twinning! if only we lived closer. Took the words right out of my mouth!! I’ve been explaining this philosophy to many of my customers in the supermarket these past couple days.